One of my favorite things to do is travel within the United States. Going out of the country is exciting and all, but I love seeing places right here. There are so many incredible landmarks and different cultures right here in the United States, and I love exploring that. Plus, I don't have to learn a different language or change currency. ;) My goal is to visit every state! I had seen that people would collect coffee mugs or stickers for their guitar case from all the places they had visited, and I wanted to do something like that. I don't have the room for coffee mugs, and I don't play guitar (it's on my list of things to learn though! ), so I decided to collect magnets. Now every time I visit a new state, I buy a magnet...if I remember. Right now I have 12 magnets. I've been to 17 states but haven't gotten a one for them all yet. I bought these magnet strips from Ikea a while ago, but I haven't quite figured out where to hang them without it looking tacky or messy. Ideas anyone? I love having this small visual reminder of the places I've been able to go! 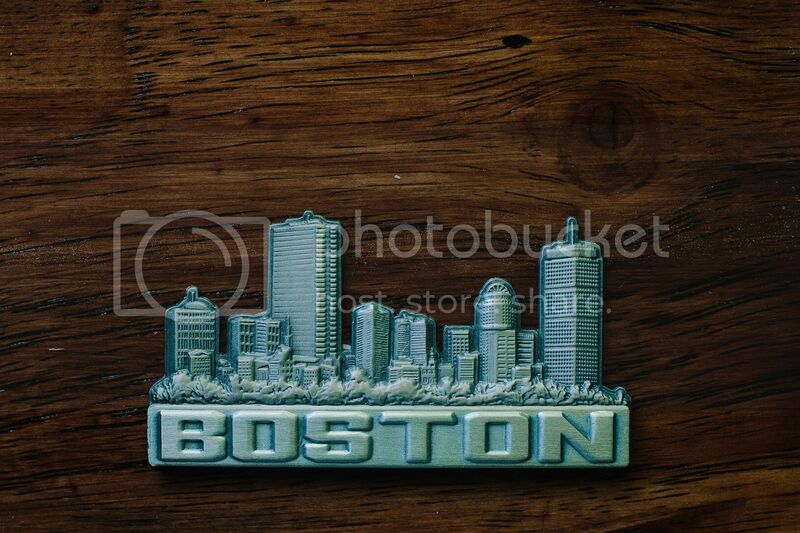 And last week I visited Boston for the second time, but remembered to get a magnet...so this is the newest one!